Today is Draw a Dinosaur Day. 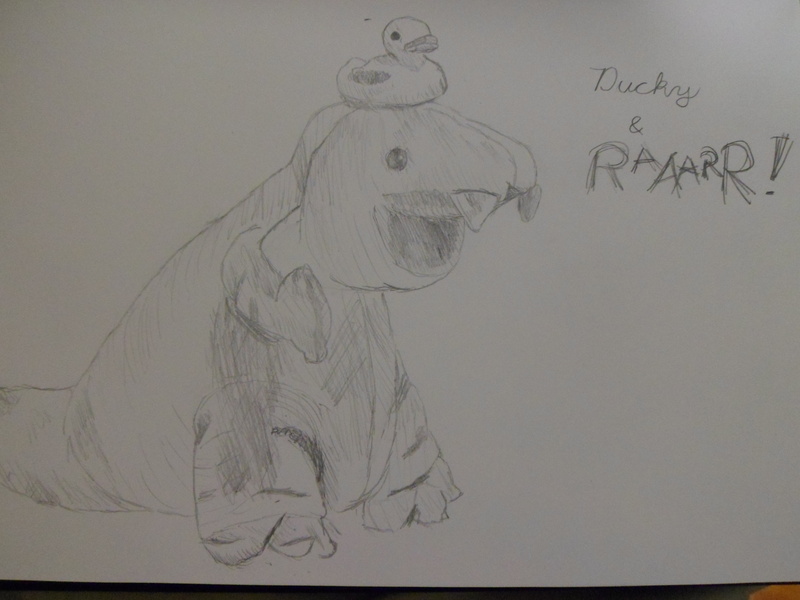 In honor of this very important holiday, which comes but once a year, I drew this picture of Raaarr and his new sidekick Ducky. I just checked a list of items that are banned in the US Capitol building. The list includes the following items: guns, replica guns, ammunition, stun guns, knives, razors, box-cutters, martial arts weapons, mace and pepper spray, knitting needles, letter openers and water. That means It is illegal to take any of these items into the gallery of the House of Representatives, and congressmen are not allowed to carry them when the House is in session. This is completely unacceptable! The Republican House of Representatives is in tremendous danger. If anything were to happen on the House floor, there wouldn’t be any brave American citizens in the gallery carrying concealed weapons, ready to subdue the attacker with lethal force. But think of how brave the Republican Congressmen, those guardians of our democracy, must be to go to work every morning in a gun-free environment — in a place where they can’t even carry a knitting needle or a bottle of Evian to defend themselves from an attacker! Think for a moment of the selflessness that they are exhibiting when they try to pass laws allowing concealed weapons in schools. They are willing to put the safety of school children front and center while disregarding the fact that they themselves live with the very same threat every day. We made the right choice when we elected these exceptional men to be our leaders — they are truly willing to brave any danger to keep the children of America safe! Every year since 2001, I’ve written a summary of my year on, or about, New Year’s Day on my LiveJournal. Well, I don’t really use LJ anymore, so I’m moving it here… and keeping it clean, since I don’t have the “Friends Only” feature anymore! – Holly introduced me to Caroline, a very talented portrait painter. We went on our first date on January 26 and are still going strong. – Dragged Olga and Lindty on long walks in Harriman State Park. – On one of those walks, I was bitten by a tick. I’m still not sure if what I had was Lyme Disease or something similar. All I know is it was the most miserable, exhausting experience of my whole life. I was so tired I could hardly hold my head up for a month. – While I was convalescing, I made a goal to hike the entire Appalachian Trail in New York and New Jersey this summer. The last weekend of April, I did the section between the Metro North station and the Connecticut border (15 miles). On Memorial Day weekend, Ryan and I walked from Delaware Water Gap, Pennsylvania, to Port Jervis, New York (42 miles). In July, I walked from Garrison, New York, to the Metro North Station (39 miles). That left one more section on the NY/NJ border—but instead of doing that, I spent Labor Day with Ryan and his brother Trevor, hiking the section from the Mason-Dixon Line to Harpers Ferry, West Virginia. So I accomplished my goal in spirit. I can finish New Jersey this spring. – Took a summer trip to Michigan. Spent some time at my dad’s trailer at the lake, got buzzed by planes, floated down a river on inner-tubes, ate ice cream, visited my grandfather in Suttons Bay, toured a vineyard, went walking at Pyramid Point with my mom. – Fall was a tough time at work. My boss was on maternity leave and everyone else in my department was hired over the summer. Work took over my whole life for four months—hardly any writing, hardly any socializing. Ugh. – Celebrated by 10th Friend-iversary with Liz. The party involved balloons, sock puppets and mustaches. Twas wondrous! – Weekend visits from Mom, Dad, and Ryan & Ulli. It was great to see everyone, but with what was going on at work it was kind of an ordeal. – “Trapped” in Philadelphia with Caroline for Hurricane Sandy—a wonderful hurrication. – Spent Thanksgiving at Caroline’s parents in Arlington, Virginia. – Family Christmas in Michigan. Saw my grandfather, Mom, Dad, Kris, Dana & Justin, Whit & Casey, Lynn & Judy. Generally a delightful time. NEW YEAR’S RESOLUTION: Work a little bit on my novel every day. Doesn’t have to be more than a few paragraphs, so long as I keep moving forward, little by little. As of January 8 I haven’t missed a day yet.